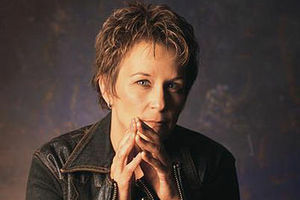 Acclaim has followed Mary Gauthier every step of the way after picking up a guitar at age 35 and making her way to open mic nights on Boston’s busy coffeehouse circuit in 1995. Since 1997 Mary has released six albums and was published in a collection of short stories titled Amplified. She released her debut album, titled Dixie Kitchen in 1998, named after a restaurant she owned. To her surprise, she was nominated for Best New Contemporary Folk Artist at the Boston Music Awards. Her second release Drag Queens in Limousines (1999, with her signature “I Drink”) drew a four-star rating in Rolling Stone and broke Mary’s career wide open, as she became a presence at folk festivals across the U.S. and Europe. The title tune won Best Folk/Singer-Songwriter Song at the first annual Independent Music Awards; the album earned the Crossroads Silver Star Award; and Mary was named Best Country Music Artist at the GLAMA’s (Gay and Lesbian American Music Awards). With her third CD, Filth & Fire (2002), Mary began an association with Gurf Morlix, former sideman and producer for Lucinda Williams. Filth & Fire was named Best Indy CD Of The Year by Jon Pareles of the New York Times, the Best Singer/Songwriter Album Of The Year by No Depression, and Freeform American Roots poll critics chose Mary as their Female Artist Of The Year. With the release of her next album, Mercy Now (2005), again produced by Morlix, Mary graduated to major label status as she joined the prestigious Lost Highway label. Around the same time, Mary officially moved to Nashville. Mercy Now appeared on a score of year-end “Best Of” lists, including the New York Times, Los Angeles Times, Chicago Tribune, Billboard, and No Depression. Mary was named New/Emerging Artist Of The Year at the annual Americana Music Association Awards, and Bob Dylan included “I Drink” on his “Theme Time Radio Hour” program. Her newest album, The Foundling, was named the #3 record of the Year by the LA Times writer Randy Lewis. Written and recorded over the course of two years, The Foundling was produced in Toronto by Michael Timmins of Cowboy Junkies, using local musicians and his sister Margo Timmins on vocal harmonies. The Foundling is Mary’s first concept album, ands she opens the door on the defining circumstance of her life, the emotional journey and aftermath of finding the mother who surrendered her in New Orleans after her birth in March 1962.